The first annalistic mention about Terebovlya belongs to 1097. But the archaeological excavations showed up that the settlings of the Castle Mountain belong to the 3rd thousand B.C. In autumn of 1097 in Lyubechi the convention of princes took place. It was decided there to preserve Terebovlya under the authority of Prince Vasyl’ko. Svyatopolk - the prince of Kievskiy, invited Vasyl’ko to visit him, then with the help of lie grasped the prince, took him out to Zvenigorod (not far from Kyiv) and blinded. So it was Terebovlya castle, where blind Vasiyl'ko lived till the end of his days, knowing the territory quite well to move freely. Post mortem Vasyl’ko, Terebovlya lost the status of capital. 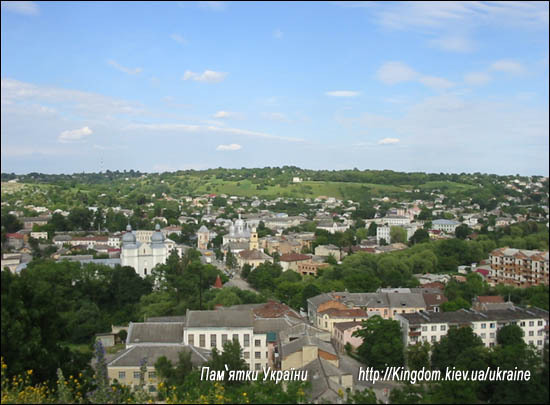 In 1139 it lost also its status of princely city and became one of Halychyna state principalities. 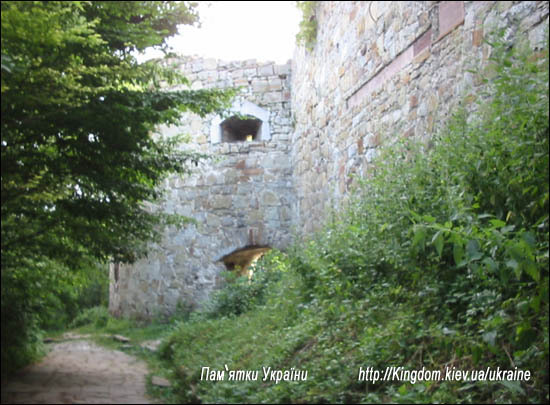 During the reign of Prince Vasyl’ko Terebovlya was surrounded by billows and fortified with paling. 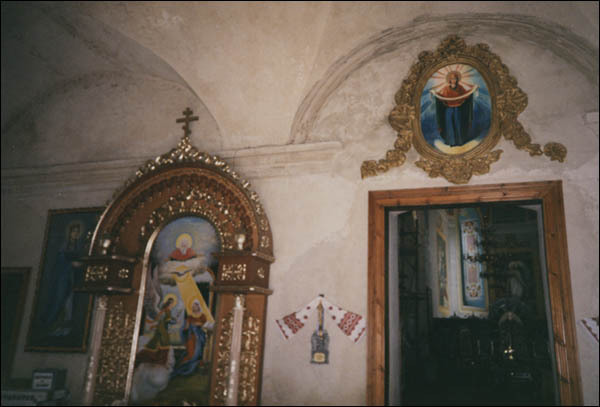 The city was to be entered only through three gates - Galytska (Zubivska), Zvenihorodska (renamed later into Lvivska) and Kam'yanetska. Possibly there was the fourth gate standing in the nowadays Sichovi Striltsi Street. In 1340 Polish king Cassimere the Great seized Halychyna, so Terebovlya turned to be under his authority as well. Here he built his own fortress. In 1389 Terebovlya was given the Magdeburg right. In 1415-1429 King Yagaylo rewarded his servant Bartosh from Terebovlya and allowed him to build a new city. Since then the city contained two parts: a new one – on the bank of the river, and the old one – near the castle. Both parts were connected with a bridge. Habitants of the new part of the city were freed from work for 8 years. 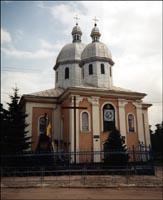 In 1434 Terebovlya obtained the status of the local township. It became the city of boundary value – it executed the defensive role against Turks and Tatars attacks. In 1453 Tatars hordes devastated the city. In 1467 Turks began their attack as well. In 1497 Polish king Ol'brakht also passed through Terebovlya with his soldiers. In a year Tatars and Walachians destroyed the city almost utterly. To assist the rapid renewal Jan Ol'brakht exempted Terebovlya from taxes for 8 years. But as the city was permanently facing the bad luck, already in 1503 Turks and Tatars attacked it again. Though in 1509 Polish king (Lithuanian prince) Sigizmund granted Terebovlya with privileges and in 1518 he made its habitants free from all taxes and contribution. As the castle of the city had been destroyed by permanent sieges, a new one was built by castellan Tenchinskiy. So Terebovlya acquired a great defensive value. In 1539 and in 1549–1550 the city was given new privileges. It was rebuilt to some extent; nevertheless in 1575 Tatars attacked the city again. For 20 years, beginning from 1605, Tatars attacked Terebovlya 15 times. The ruins of the castle are located in the north-western part of Terebovlya on a mountain, which was almost unattainable from all its three sides. The north side – the feeblest one, was protected by ditches and billows, belonging yet to princely times. The castle’s length from north to south is 122 m, from east to west - 65 m. According to the plan of the castle, it has a distorted, stretched and constricted southward form. Some more historical and physical data about the ruins: today the castle’s walls stretch for 12-14 m; they are 5 m wide and intersect to the corner of 100 degrees. 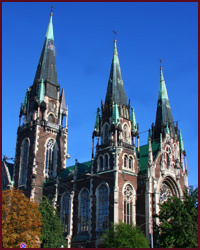 The corner is formed by two straight lines ending with towers: tetrahedral eastern tower and hexahedral western one. The third tower is located in the south; according to the plan it has a form of ellipsis connecting two elongated defensive walls. The walls height is 13 m, and their width varies from 3.5 to 5 m. The northern and western towers preserved their height of two tiers, and the eastern one - of three tiers. An entrance to the castle was made in the eastern defensive wall being only 2.5 m thick – much thinner, if to compare with other walls. The entrance is designed in the renaissance style, near the entrance arch there is a fence. 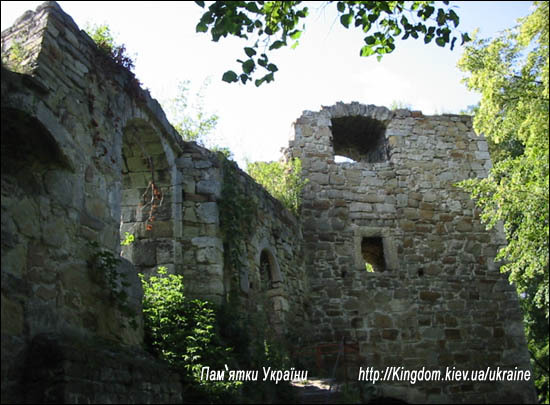 The ruins of Terebovlya castle are the leftovers of the castle of Alexander Bolaban, who was the head of Terebovlya and built his castle in XV century. Till those times on this place there had already been built three castles. 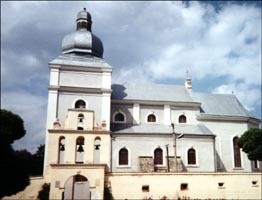 In 1986 the archaeological research headed by Borys Tymoschuk showed the following results: "The excavations of billows on the Castle Mountain and the other materials obtained by the expedition showed that the princely fortress from which the city began its existence had been built at the edge of IX-X centuries". 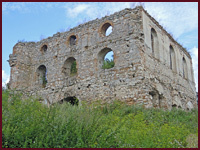 The existence of the castle can be proved with the remains of some written papers found and signed by special commission in 1632, during Alexander Balabans (the head of the town) castle being built: "In the castle, where there once was a monastery or an old palace, there are great stone ruins…" Probably, these were the relics of Prince Vasyl’ko’s court church, for by then the castles were wooden but the temples were built from stone like in Byzantium. On the territory surrounded by strong walls there were: the princely palace, a church, a kitchen and barns for food storage for the case of siege. On that territory there was no well by then, so the water was possibly tricked into underground conduit channeling upstream water of Pechiniya River, though simple water reservoirs are also supposed to have been there. But the castle description details are not as interesting as the legend of those times. So, here it is. Once in old times there was a palace with great stony undergrounds. The Prince living there had his favorite wife and a beautiful daughter. The young lady was so beautiful that her beauty made any young man, giving her a glance, grow numb. But the Prince’s wife died, so he grieved heartily. But afterwards the Prince married another woman. Nobody knew she was a witch. The new wife didn’t like the Prince’s daughter because of the girl’s youth and beauty. One more reason of the stepmother’s strong dislike was that only the Prince’s daughter had the keys for chests with princely gold, as the prince entrusted the keys only to his daughter. The wicked stepmother turned the young princess into a viper holding the keys in its mouth. Since then each time on midnight of Ivan Kupalo celebration that beautiful woman-princess, turned into a viper, opens seven iron doors in the cave of the Castle Mountain. She goes out from there expecting that a young fellow will bring her the flower of fern and take away the keys by a kiss from the mouth of the bewitched creature. Then the wicked stepmother’s blasphemy will fall. 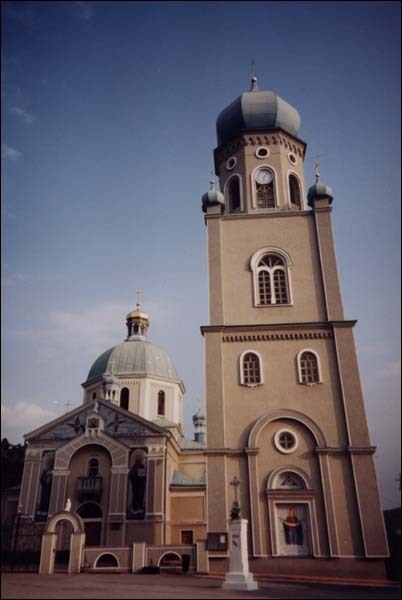 Having taken up Halychyna the Polish king Cassimere the Great began to fasten the east scopes of the state, building fortresses. So approximately in 1360 a fortress was built in Terebovlya. On the ruins of the old wooden one, being built in times of Vasyl'ko, Cassimere erected a stone fortress. There are no descriptions and pictures left concerning this fortress. Though it is supposed, that the stone fortress reminded Vasyl'ko’s one, but instead of paling there were built walls by 1.5-2 m thick, the ruins of the princely stone church (under which Vasyl'ko is supposed to be buried in asarcophagus) were turned into the entrance tower, and a security tower was built near it. Possibly in the middle of the court there were located the housing apartment and a well of 45 m depth. This castle existed for 170 years. Permanent raids of Turks and Tatars at the beginning of the 16th century made the castle useless for the city defence. In 1534 the head of Krakiv Andzhey Tenchinskyi using his personal funds began the construction of a new castle. Only several months were needed for the castle to be built up again. The walls were repaired and instead of the destroyed ones new wooden barns squared beams were built on high foundations. The new palace was also built on high foundation; high stone stairs lead to its entrance. 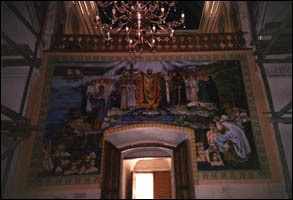 The palace was made from oak, though not luxurious, the roof was covered with special wooden coating. The fence was situated in the north, with a small room of a clerk above it. 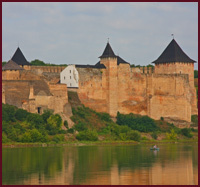 In 1594 causing no damages to the castle Severin Nalivayko takes it. In the period of 1605-1625 the fortress and the city survived 15 Tatars attacks. Having got considerable damages the castle lost its defensive might. And, finally, the Castle of Alexander Balaban, which we can see now. The period of ten year rest began in the history of Terebovlya in 1630. It allowed the Head of the city to build a new mighty fortress. 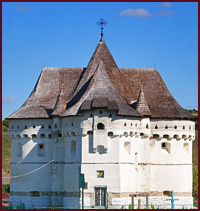 This fortress had three tiers of defense and three towers: the first one for nobility (western), the second one – basic and the third one – near the gates. The mightiest tower-roundel (ellipsoid according to the plan) was situated in the southern corner. There were five loopholes on the ground floor, to which the arched entrance with double gates led, so if an enemy broke through the first gates it would appear in a trap. The second tier had 7 loopholes. The western tower had a hexagonal form; on each of the first two tiers of the tower there were 5 loopholes and some small holes for the hot water confluence. The northern defensive wall having its height of 18 m was considered to be the mightiest. The east tower had 4 corners and three tiers; it was situated near the gates to protect the castle entrance. The entrance to the fortress was in the east wall; it had a form of arch and was situated on height of 3 m from the earth’s surface. To penetrate into the territory of the castle, it was necessary to go round the east tower under a breech-sight, to walk up the special dais and on the very bridge to move through the gates. The bridge of pander leaned with one end on the gates cornerstones and with another one - on the wooden dais. The palace size was 44 to 7 m with four cellar apartments. In 1650 the fortress survived a 10 days siege of Cossacks and in a year the 9 weeks siege, when Cossacks helped Tatars to fight against the Polish army. In 1672 fortress was conquered by Cossacks. In autumn of 1675 Turks and Tatars besieged Terebovlya for two weeks. When the wife of Khshanovskyi Sofiya got to know that the castle was going to hand over, she heaved up an army to guard it and the castle withstood the siege. But after this battle the castle was destroyed. In a year it was repaired. The years of 1684-1688 became fatal for the castle of Terebovlya – it grew into ruins from which it has not been renewed. Now these picturesque ruins can only remind about former durability and grandeur of ancient fortresses. Today only silence and loneliness meet the visitors of a former yard, covered with herbages. The monastery had once a defensive value. Built in 1635-1639 it was surrounded by a defensive wall and towers. As to its architectural style the monastery is considered to represent the architecture of renaissance baroque. Now it is functioning as an orthodox church. 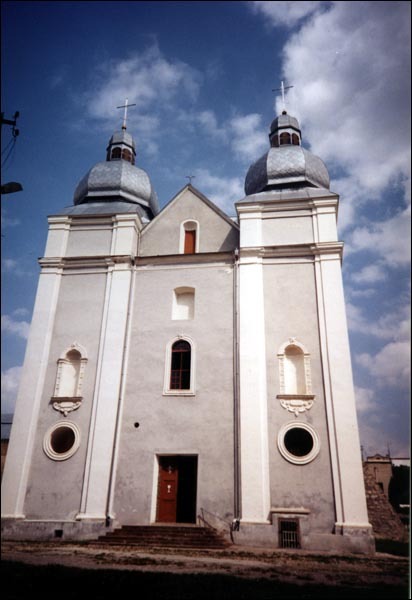 The building of Mykolayivska church belongs to the 16th century; it was reconstructed in 1734 and once functioned as a defensive building. 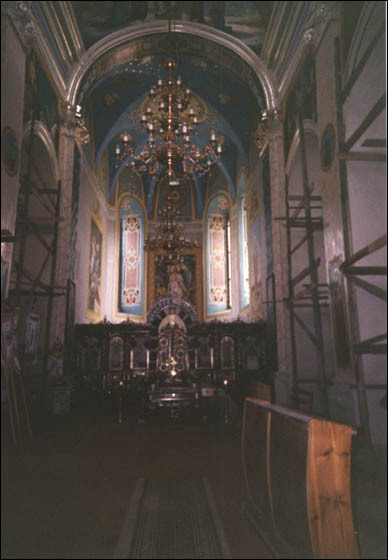 Recently it has been reconstructed as well.